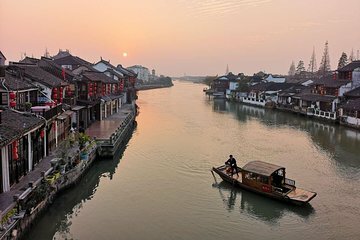 Explore Zhujiajiao with a private guide on this 5-hour tour from Shanghai. With your dedicated guide, take a boat ride down the town's small canals and visit the KeZhi Garden. This private tour ensures personalized attention and a flexible schedule. Tom Zhang was a fantastic tour guide, he made the trip come life with the narrative, was very accommodating and flexible and did a great job all around. He was very knowledgeable about not only the town of Zhujiajiao, its sites, history, and cultural customs, but he was also very knowledgeable about China's history overall. I thought that the Zhujianjiao Water city was a very nice town to see, with a rich history that gives you a sense of what it might have been like to live there over the centuries. I had a special request to go to the silk museum tour in Shanghai and even thought this was not part of the regular tour, he accommodated me. Very nice day. What a wonderful day trip with our guide Tom. He was incredibly knowledgeable and so nice. He picked us up at our hotel in downtown Shanghai spent half day with us and then for a small additional fee 40 dollars US he drove us to our second hotel at Shanghai Disneyland. It was a perfect private tour that was beautiful, historic and effortless! The boat ride was amazing as well and the gardens were my favorite!! Tom spoke fluent English and had many years of experience!! Couldnt have been a better trip!! Cindy was a great tour guide. She was on-time for the pick up at our hotel. One the way to the venue she gave us many tips about what to see and do in Shanghai. She was truly knowledgeable on the historic details and key landmarks that we came across at Zhujiajiao. Most of all, the kids really warmed up to her. Awesome tour and good food! What a fantastic tour. Our guide Tom was a friendly guy who spoke perfect English. His knowledge was outstanding. We would definitely recommend the trip. Excellent value for money. David was an excellent guide. He met us in our hotel and we drove in a modern and comfortable van to the water village with David sharing his experiences and tips as a native Shanghai. We loved his slice of life talk as much as his very informed historical talks. The boat ride was enchanting. We enjoyed window shopping in the town and sampling the local treats. But the best part of the tour was thru the gardens. We had them practically for ourselves and it was a wonderful contrast to the busy streets of the village and the skyscrapers in Shanghai. David was able to adapt to our interests and leave us to wander them in our own time. Ps, he was nice enough to help us take group photos in the perfect spots. Would highly recommend. Perfect for those with a short schedule, this half day tour was very memorable! Excellent tour with knowledgeable and English speaking guide. Highly recommend. Tom, our guide, arrived promptly at our hotel lobby at our agreed time. He drove us in a clean, air conditioned van to Zhujiajiao water town. Tom is very knowledgeable and presents information that makes the tour very interesting and educational. Without a guide it would be difficult to fully appreciate the history and culture of the town. Tom provided a private tour for our group of 3. I believe that the fee for this tour was very reasonable. Tom provided a 5 star service. After my wife and I did this, we realized everything we thought China was, was wrong. I honestly didn't know what to expect. My wife and I had never been to China, and since I didn't have a phone that worked in China, I was ready for the logistics to fall through and lose all my money. Tom, our tour guide, showed up 10 minutes before our agreed time, walked right up to us in our hotel lobby and said our names in clear english. That was a relief. He then took us here where we were blown away at this little town. With him, you get a truly authentic China experience. We asked him a hundred questions about the city, China, what its like there, etc. He entertained all of our questions and the tour was so much more than we expected. We rode on one of the little river boats, walked along the market streets, had some delicious local food, saw some local gardens, bought some souvenirs, and said hello to some local pets! He took us through the gardens there and was full of insights into China's history. It was the smartest move we could have made to fill the time in our 24 hour layover. Oh yes and he dropped us off to ride the mag-lev train back to the airport like we asked. He's the perfect guide and very informative! Great tour and great guide.